A couple of close games and a couple of laughers in the system on Thursday night, including a strong start from Stephen Gonsalves and a combined shutout from Elizabethton. Come check out what else happened across the minors. The Red Wings scored four in the first, three in the second, and four more in the third, racing off to a 11-1 lead, and then put a few more runs on the board over the next several innings to win the game 14-3. As a team the Red wings had just 11 hits but FIVE of them were home runs. The Red Wings were led by a 3-for-5 night from Tyler Austin. Austin had a triple, a home run, three RBIs, and three runs scored. Taylor Motter, Kennys Vargas, Jon Kemmer and Jeremy Hazelbaker also added long balls of their own. Nick Gordon continues his rough stretch, going 0-for-3 with a pair of walks. 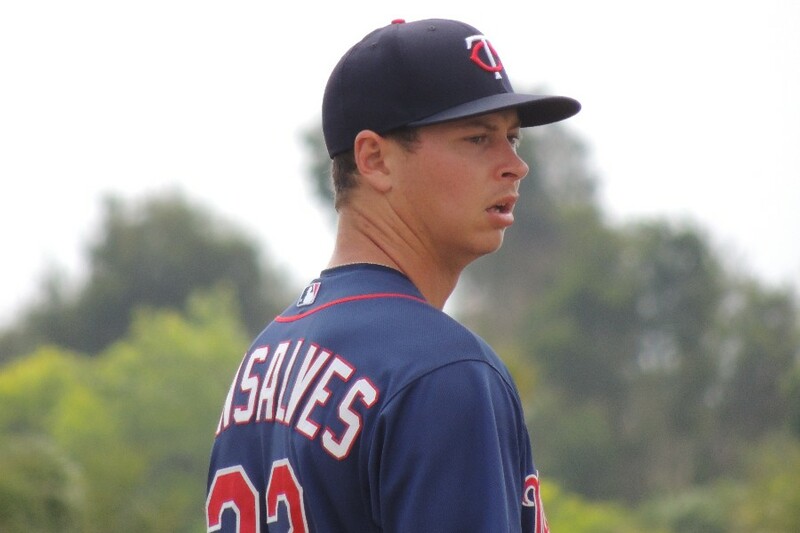 On the bump, Stephen Gonsalves went 6.0 innings, gave up just three hits and three walks, striking out nine. He gave up three runs, all earned, and picked up his eighth victory of the year. Jake Reed pitched 2.0 hitless innings, keeping the Mud Hens off of the board and striking out four of the seven batters he faced. Ryne Harper pitched the ninth, he gave up one hit, no runs, and struck out a batter. Down 2-0 in the bottom of the ninth inning the Lookouts pushed one run across on a Mitchell Kranson double and left the tying run on second base. The Lookouts managed just five hits, two of them doubles, one each from Mitchell Kranson (1-for-4) and Brian Navarreto (1-for-4). Overall the Lookouts were pretty well shut down by Jackson starter Taylor Widener who struck out nine batters and didn’t walk anyone. Lookouts pitching wasn’t bad, giving up just a pair of runs, one each from Tyler Wells (6.0 IP) and one from Ryan Eades (2.0 IP). Devin Smeltzer pitched the ninth, keeping the game within reach with a scoreless frame. Fort Myers needed a run in the top of the ninth inning to keep the game alive, down 2-3. Caleb Hamilton singled to start the inning, was pinch-run for by Aaron Whitefield, who took second on a throwing error on a pickoff attempt and advanced to third on a wild pitch before eventually scoring on a Royce Lewis triple to tie the game and send things to extra innings. In the top of the 10th, with Taylor Grzlelakowski as the free runner on second base to start the frame, Jose Miranda was hit by a pitch to put runners at first and second. Alex Kirilloff gounded into a double play but Grzlelakowski advanced to third base and eventually scored on a wild pitch, enough to give the Lookouts the win after Ryan Mason kept Florida off the board in the bottom of the frame. Royce Lewis was 3-for-4, including that game-tying triple, with an RBI, a run scored, a walk, a stolen base and a strikeout. Jose Miranda had a 2-for-4 night and Travis Blankenhorn was 2-for-4 with a double. Brusdar Graterol went 5 2/3 innings and left with a no-decision, giving up two runs on six hits, walking one and striking out four. Anthony Marzi turned in 2 1/3 innings giving up a run on one hit, and Ryan Mason picked up a victory with two innings of scoreless baseball. Cedar Rapids used a five-run fifth inning to put Thursday night’s game away. Michael Helmen was 3-for-5 with two runs scored and a double. Ben Rodriguez was 2-5 with a run scored, a double, two RBIs and two Ks. Lastly, Jacob Pearson was 2-4 with two runs scored, a double, a walk and a strikeout, capping off the list of Kernels with multiple hits. Ryan Jeffers’ only hit was a solo home run. The Kernels starter Randy Dobnak went 6.0 innings, gave up six hits, three runs, a walk and five strikeouts. He earned a win to move to 8-4 on the year. Derek Molin earned his first save of the year with 3.0 innings of one-run baseball. He gave up two hits and struck out five. Elizabethton pitched a four-hit shutout on Thursday night with Andrew Cabezas kicking things off with 6.0 innings of two-hit baseball. He walked two and struck out four. Jacob Blank earned a hold for his 2.0 scoreless innings and Jach Neff closed off the game with a scoreless ninth. The Twins picked up just four hits, but Ricky De La Torre had half of them, going 2-for-3 with a home run and two RBIs. The other Twins run came from a solo home run from Colton Burns, part of a 1-for-1 night that included the home run, two runs scored, and two walks. The GCL Twins rode a strong start from Kai-Wei Teng to a 5-2 victory on Thursday afternoon. Teng pitched 5 2/3 innings, gave up a pair of runs and stuck out nine batters while walking none. Frandy Torres went 1 1/3 innings, gave up no hits, walked one and struck out a pair. Erik Cha earned his second save of the year, this one the six-out version, with 2.0 innings of scoreless pitching. He gave up a hit, a walk, and struck out four. The Twins spread their seven hits around and just Austin Hale (2-for-4) had more than one. All five runs came from the bottom of the Twins order with Alberoni Nunez, Austin Hale, Charles Mack and Samuel Vasquez accounting for all of the runs scored from the 6-7-8-9 spots. Charles Mack was 1-for-2 with two runs scored and a pair of walks. Judging by his name Kai-Wei must be a change up specialist. Kai-Wei Teng.... waiting.....terrible i know.. The fact that Wells was bumped from the top 30 is so wrong. He has better numbers than almost ALL of the ones on there. He needs to be on it. Good for him. Any chance Royce and Kirilloff go up to AA this year ? I had him at #17 when we did our rankings and before the trade deadline... He's at 21 on my living rankings right now, but this kind of success in AA will push him further up the ladder. Michael Helman.Nice 11th round draft pick from the looks of it. Slashed a cool .375/.435/.575 in rookie ball and is now not missing a beat with the Kernels. From what I understand the Twins used a lot of TrackMan analytics on Helman before making the draft pick.Melded the visual scouting with many data points. So far, it appears money well spent. Looking forward to Gonsalves 2020 debut. Michael Helman. Nice 11th round draft pick from the looks of it. From what I understand the Twins used a lot of TrackMan analytics on Helman before making the draft pick. Melded the visual scouting with many data points. So far, it appears money well spent. Well, Helman is 22 years old, and he was a pretty solid hitter in college too. Why isn't Gonsalves going to MN? Looks like time for a few more movements upward for key players throughout the system. Miranda is settling in nicely in Fort Myers with a 3 game hitting streak (out of 4 games) and his first multi-hit game last night. Nice starts by Gonsalves, Wells, Graterol and Cabezas.Where did Cabezas come from? Will second the above comments about Helman.He just keeps hitting and is now doing it at Cedar Rapids.Can't continue, can it?And how about Ricky De La Torre?This kid is known for his glove, yet, is having a real nice season at the plate. Heading into Rochester tonight, hopefully the Kohl Stewart Project will continue to evolve. Gordon gets a couple of walks today. He's had a few nice games in a row. Good to see. I agree. I think he's earned a September callup if nothing else. I see Stephen as a lock for a call-up by September 1 and am not going to sweat the details until then. He had one good game and some walks.He was gifted a TD Hitter of the Day Award when there were at least 3-4 more deserving candidates. Let's watch that sample size over the rest of the month for these two players. My money would be on Arraez passing Gordon on the prospect board sans bias. For some, I think he already has. It could be a sign of having taken the first step toward respectability. If a batter's been getting himself out, the pitchers simply stop throwing strikes. So, eventually, you wise up and start taking the walks that are offered. Now, to find out if he can do anything, when the book on him gets re-rewitten a little bit again, and some strikes are offered to him. Love these minor league reports, especially the top 20 summary. Totally agree on the sentiment that Gonsalves debut is way overdue. I realize the walks are up but the results are there. How can we base our future with prospects on September performances in MLB if it's against Detroit, Chisox, and Royals while they--like Twins--are tanking? For the most part I'm very happy with our front office moves, but am totally baffled with our claims on other teams' discards instead of using our own prospects on the 40-man. Belisle, Drake, Field?! Why? Moderator's note: OK, I know no harm was intended, but let's go easy on making fun of Asian names please. Thanks for the great minor league updates, one of the best parts of the site.Now that minor league seasons are heading into the home stretch, could we get updates on playoff races included in the relevant summaries, please? Gordon has the pedigree and the bonus money. Have you seen Arraez? He's only a little more inspiring athletically than Willians Astudillo and even more diminutive, he has a bum knee and is not a MLB SS, maybe not even a 2B or 3B. Don't get me wrong, I hope he's the 2nd coming of Altuve, because this kid can definitely hit. I just don't see him passing Gordon on the prospect board- Gordon will get the first shot to stick. Gordon's problem appears to be long-term stamina, as his 1st half stats are Top 100 worthy- perhaps there's a diet deficiency or metabolic malady? Because he's still walking too many guys? He's on pace for a career high in BB/9. Considering how many guys come up and nibble even more in their first spin at MLB, could be a recipe for disaster. i still expect him to get a look in Sept, but let's not pretend he doesn't have things to work on. Would like to see Gonsalves and Jake Reed come up. These guys have nothing more to prove at AAA.